At Henseler & Kocian Orthodontics, we're proud to provide comprehensive orthodontic treatment to the Woodbury and Stillwater, MN communities. As a leading practice in the area, we offer a wide range of orthodontic treatments and work with patients of all ages from young children to adults. Every patient is different, that’s why we offer a number of treatments to help you achieve your best smile – including Invisalign. When most people think of orthodontics, they picture the metal lattice of brackets and wires that make up traditional orthodontic braces. Braces are the most popular orthodontic treatment we offer, and they are still an excellent option for many patients. However, with Invisalign, there is an alternative. Instead of brackets and wires, Invisalign uses a series of clear, removable plastic trays (aligners) to gradually straighten teeth. These aligners fit directly onto the dental arch, are virtually invisible when worn, and can be popped in and out to eat, drink, brush, and floss. It is an innovative way to straighten your teeth – and more and more patients all over the country are choosing Invisalign. Virtually Invisible: Unlike braces, Invisalign aligners are almost impossible to see when worn. This means that whether you have an important presentation at work or a big social event, practically no one will notice you are getting orthodontic treatment. Eat What You Want: With braces, you have to avoid sticky and crunchy foods, as they can damage your braces. But with Invisalign, you remove your aligners to eat, allowing you to enjoy all your favorite foods. Improved Comfort: Invisalign aligners are smooth and lay flat against the teeth, minimizing the tiny cuts and scratches that may come with braces. Oral Hygiene: You remove the aligners to brush and floss, so maintaining oral hygiene is as easy as ever. First, you will come in for your complimentary consultation. At that appointment, our doctors will discuss your concerns and perform a comprehensive examination identifying any orthodontic problems. If together we decide that Invisalign is right for you, a digital scan will be taken of your teeth – essentially making a model of them – which is used to design a custom treatment plan to help you achieve your smile. That day we can even show you a simulation of your final result! We will then send the plan our doctors have approved to Invisalign to create your custom aligners. You will wear each set of aligners 22 hours a day for about 2 weeks before switching to a new set. With each new pair, your teeth move closer to their final positions. When you finish your last pair of aligners, your new smile is yours to keep! Invisalign is a great treatment option for adults – but a new version called Invisalign Teen has been created specifically for teenagers. 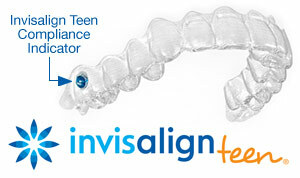 Invisalign Teen comes with many features designed to suit the teenage lifestyle. Each aligner comes with a built-in compliance indicator, letting parents, doctors, and patients themselves know if the aligners are being worn enough. And finally, every Invisalign Teen treatment course comes with 6 free replacement aligners, so there's no need to worry if any get lost or stolen. It is an excellent option for busy, socially-conscious teens! With Invisalign, you will never have to worry about using cumbersome devices like floss threaders – but you will still have to take good care of your teeth. Remove your aligners and brush your teeth at least 4 times per day: once after breakfast, once after lunch, once after dinner, and once before bed. You will also need to floss daily, and you should brush your aligners every time you. If you are ready to take the next step towards a more beautiful smile, the team at Henseler & Kocian Orthodontics would be thrilled to help you. Contact us today with any questions or feel free to request an appointment online at one of our offices. Working together, we will help you achieve a beautiful new smile that lasts a lifetime!